(2015). Therapeutic Effect of Deferasirox and Glycine on Chronic Cadmium Toxicosis in Rats. International Journal of Advanced Biological and Biomedical Research, 3(3), 231-236.
. "Therapeutic Effect of Deferasirox and Glycine on Chronic Cadmium Toxicosis in Rats". 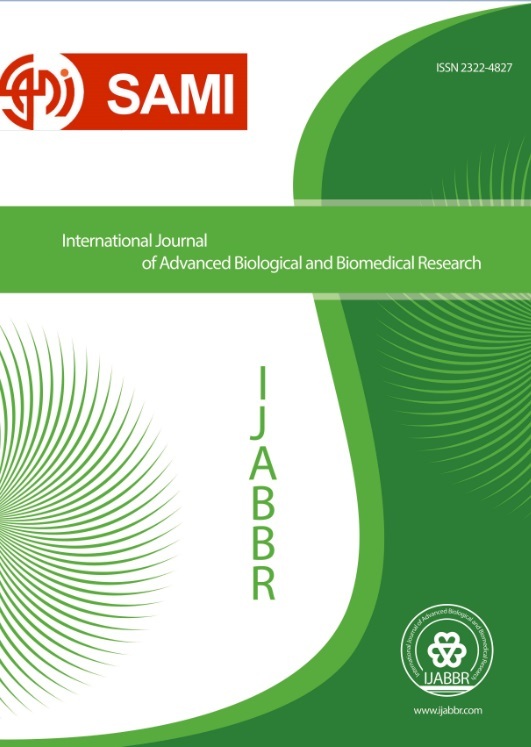 International Journal of Advanced Biological and Biomedical Research, 3, 3, 2015, 231-236. (2015). 'Therapeutic Effect of Deferasirox and Glycine on Chronic Cadmium Toxicosis in Rats', International Journal of Advanced Biological and Biomedical Research, 3(3), pp. 231-236. Therapeutic Effect of Deferasirox and Glycine on Chronic Cadmium Toxicosis in Rats. International Journal of Advanced Biological and Biomedical Research, 2015; 3(3): 231-236. Objective: It has been shown that deferasirox can reduce blood and tissues lead content in animal models. In this study the effect of deferasirox alone or combined with glycine as an antioxidant was evaluated in chronic cadmium toxicosis in rat. Methods: Male wistar albino rats were exposed to 200 ppm cadmium in the drinking water for 3 weeks and treated thereafter with deferasirox (140 mg/kg), glycine (1000 mg/kg) and deferasirox (140 mg/kg) + glycine (1000 mg/kg) by oral gavages, twice daily for 7 days. The effect of these treatments on blood, liver, kidney, bone and testis cadmium values and parameters indicative of oxidative stress (superoxide dismutase, catalase, glutathione peroxidase and total antioxidant capacity in blood) were investigated. Results: Deferasirox was found to be effective in reducing cadmium level in blood, liver and kidney and glycine reduced cadmium levels in bone. Individual administration of deferasirox or glycine mitigated the effects of cadmium on some indicative parameters of oxidative stress in blood. But the best results were obtained following co-administration of both drugs.